With his latest port of call being home to a visitor attraction that cost some £97 million, Little Watty expected something special – and he was not disappointed! Viewed from above, the building resembles a white star and below the four projecting segments are each shaped like a ships prow, the facade being covered by faceted plates that reflect light so that the effect is reminiscent of a great liner ploughing through ocean waves. This made Watty feel quite nautical, which was not surprising as this attraction is in an area with a legacy of ship building and commemorates a hugely iconic liner that launched from there a century ago and is still talked about today. To be in with a chance of winning your very own cuddly Little Watty Baxter, simply look at the photograph and tell us the name of the building, which it has to be said left Watty with what he later described as “A Sinking Feeling”. 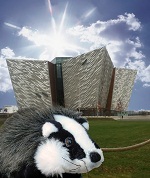 The winner will be chosen at random and will receive a cuddly badger. The closing date for this competition is 01 February 2013.